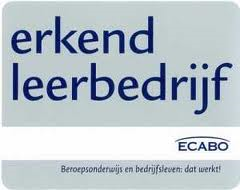 At Tandarts Praktijk René we service the whole family, adults, children and teenagers. 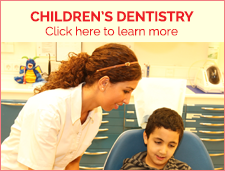 Our team of hygienists are specially trained to teach children how to care for their teeth. Below is Dentist Rene’s advice for parents. “I advise parents to bring their child to the dentist at a fairly young age so that they can get used to going to the dentist and have a positive experience at the beginning. 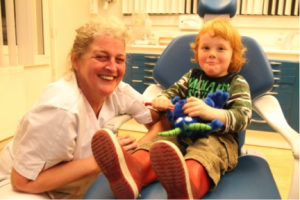 You can start as young as 2 and the hygienist or dentist can just take a quick look to see if everything is ok.
Then I advise an annual visit so that the child can get used to coming to the dentist. 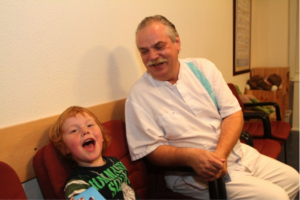 I don’t like to force children to sit in the chair or to go to the dentist so it is good to get them comfortable with the idea of visiting the dentist regularly. The best thing you can do for you child’s teeth and health is to ensure that he learns how to care for his teeth really well. Our hygienists take their time with children so that they learn this at an early age. I advise parents to make time to bring your children regularly and to listen carefully to the hygienist’s advice. Good oral hygiene will prevent a lot of cavities, pain and help your child to keep his teeth a long time. (for that matter this is true for adults too!). I have noticed in the last years that children are more prone to gum disease and are in need of treatment of their gums to save their teeth. This has a lot to do with a general change in eating habits and poor brushing. Once again I advise that your child learns how to brush his teeth properly, and that you as the parent also know how this should be done. Sometimes the hygienist will ask to see your child several times in a year to make sure this is accomplished. I advise that you don’t give your children soft drinks as they are extremely bad for teeth as well as for your child’s overall health. Sugary foods and even a lot of fruit juices are also not terribly good. You should ask your hygienist for advice on nutrition – in fact she may insist on a whole program to improve your child’s eating habits so that he can improve the health of his gums and teeth. As a biological practice we do our best to use more natural and less harmful treatments and materials for both children and adults. We want to help to keep your children healthy. By using anesthetics that are much less poisonous and have much less side effects than anesthesia used in most practices. We do not use Ultracaine or Articaine in our practice. By treatments that lower the need for antibiotics considerably. We want to help your child’s immune system to remain in tact by not prescribing antibiotics unnecessarily. We use a natural fluoride replacement treatment which is also less poisonous and avoids fluoride staining on teeth. Most of all by encouraging better nutrition and eating habits which will increase the health and well being of your child, as well improve the health of his teeth. 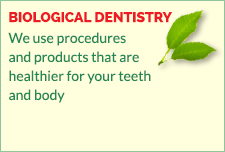 For more information go to our page on What is Biological dentistry. Remember that most dental care for children up to the age of 18 is covered 100% by your insurance company. To make an appointment for your child call 020-610-2883 or fill out the registration form.